Airbag attorney Jason Turchin represents airbag accident claims throughout the US. He is often used as a media consultant and has been interviewed by CBS Evening News, Bloomberg News, New York Times, Wall Street Journal, CBS This Morning, WSVN/Fox Miami, Telemundo, NBC6, CBS4, and other media outlets. If you were injured by an exploding airbag within the last 5 years, contact us now to find out if you are entitled to compensation for an airbag injury at 800-337-7755. If you were injured by a piece of the airbag, or a loved one was killed, call us today for a free consultation for a possible airbag lawsuit or airbag claim. Airbag claims can still be made years after a car accident, so free free to call us with any airbag injury or accidental death case question. We filed an original airbag injury claim in Florida over a year ago and have since represented several airbag victims. If you were hurt by an airbag or a family member was killed by an airbag anywhere in the world, call us to see if we can help! Many airbag cases may be brought in Florida, even if the accident occurred in other states like Georgia, Texas, Louisiana, Mississippi, Michigan, California, New Mexico, Canada, New York, Japan, Maryland and more. Who can I bring an airbag lawsuit against? Takata Corp. or TK Holdings manufactured many of the airbags in use in the U.S. today. There are other airbag companies too, including AutoLiv, TRW and Delphi. If you were injured or someone was killed by an airbag manufactured by any of these companies, that company may be sued for causing or contributing to the injury or airbag wrongful death. What is an airbag claim? If you were injured in a car accident as a result of the airbag, you may have a claim against the airbag manufacturer or vehicle manufacturer. Many states recognize that a victim of an accident can pursue an injury claim against any party who contributed to their injuries. Airbag cases are often pursued under what we call "product liability." It is a legal theory in which a product manufacturer and anyone in the chain of commerce may be sued for placing a dangerous or defective product into the marketplace that results in personal injuries or accidental death. An airbag claim arises after a car accident when the injured driver or passenger sustained injuries or died from the airbag itself and not specifically from the car accident. For example, if a driver is struck by another car, he or she may have a whiplash type of injury. Let's say the airbag also deploys and a metal piece from the airbag inflator flies out of the airbag unit and strikes the driver, causing more injuries. Metal pieces are not supposed to fly out of the airbag unit. In this case, the airbag may have malfunctioned because of a defect in manufacturing or design. The driver may be able to pursue his or her injuries caused by the piece of metal that struck the driver from the airbag manufacturer, car company or even the car dealership that sold the vehicle. Call the police. Make sure to document the accident, and complain to the police if you have any injuries. Get medical attention. If you have any injuries from the airbag or accident, make sure to request medical care at the scene or follow up with the hospital or your doctor as soon as possible. If you were injured by a piece of metal from the airbag, tell EMS or the doctor so they can properly document it. Get witness information. Witnesses to the accident and anyone who observed visible issues with your airbag can help prove your case later on. Take photographs at the scene. If possible, take photos of the accident scene or have someone else do so if you are not able. Photographs of the inside of your vehicle may also help show any issues with the airbags. Take photographs of the vehicle at your home or at the tow yard. Once the vehicle is safely removed from the accident scene, try to keep it stored and do not touch it. Photographs should be taken to help document the airbag and any visible issues like holes, burn marks or pieces of metal. Contact an airbag attorney with experience handling airbag injury cases against Takata or other airbag companies, and against other car manufacturers like Honda and Chrysler. Continue to document your injuries and take updated photographs of any visible bruising or scars. Get estimates of any future medical care you might need. 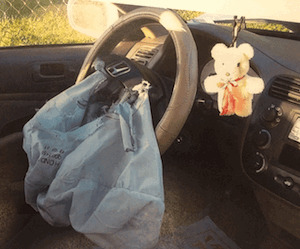 What Damages Can a Driver or Passenger Injured by an Exploded Airbag Recover? Every state provides guidelines for the type of damage a person injured by an airbag can pursue, or the damage the estate and survivors of a person killed by an airbag can collect. There are also circumstances where punitive damages may be awarded to the injured person or the estate or family of a person killed by an airbag injury. Shrapnel - When an airbag explodes, metal pieces from the airbag inflator housing may rupture and cause pieces of metal to shoot through the occupant area. These flying pieces of metal can strike the driver or passengers, causing injury or death. Metal Coil - Some airbags have a metal coil inside the inflator which may explode or rupture after a car accident. The metal can shoot through the airbag and strike the driver or passengers. Unreasonable Force Deployment - Airbags are supposed to protect you, not hurt you. Airbags may deploy with a greater force than they are supposed to and can cause worse injuries or even death. Failure to Deploy - Airbags generally deploy based on sensors. Some airbags, however, may have a compromised chemical makeup which means they may not deploy even where the sensor is triggered. Airbag Unit Malfunction - Airbags can malfunction and not operate properly in other circumstances. For example, an emblem from the vehicle can detach in a car accident and strike the driver or passengers, causing injury of death. After a car crash, your airbag should deploy when the sensors around the vehicle are triggered. A gas is released into a bag and causes it to inflate rapidly. The goal is to have it cushion the driver or passenger impact and prevent serious injuries. Some airbags made by a company called Takata were allegedly created with a chemical called ammonium nitrate. Ammonium nitrate is commonly used in fertilizer and explosives. If not handled or stored properly, it can become less stable and less reliable. Allegations were made against Takata that certain airbags they made had ammonium nitrate or a formula containing ammonium nitrate that was not stored, manufactured or developed properly. If a bad airbag is involved in a crash, the ammonium nitrate can cause a stronger explosion than expected and may cause the airbag inflator housing to rupture or explode, sending pieces of metal flying through the airbag and into the driver or passenger areas. For airbags containing ammonium nitrate, special care should be made during the storage and manufacture. Ammonium nitrate can take up moisture from humid air. This could change the phase or structure of the ammonium nitrate. If moisture contacted ammonium nitrate during storage, manufacture or while the airbag sat in someone's motor vehicle, it could render the airbag useless or dangerous. The gaskets or seals of the airbag inflator may also breakdown over time, allowing humidity to contact the ammonium nitrate. If this happens, the ammonium nitrate could be compromised and the airbag could explode upon deployment. www.victimaid.com - Defective airbag claim information in Florida. NHTSA - National Highway Traffic Safety Administration's website to search for prior complaints against car manufacturers and to see if your car is on an airbag recall list. Honda VIN Search - Check to see if your Honda Civic or other Honda car is on the recall list. Call us at 800-337-7755 for a free airbag injury or fatal accident consultation.